Order Now... SHIPS MONDAY with FREE SHIPPING! Master Momentum Tape is a high performance bowling release tape the helps provide a perfect release every time. There are 4 different color options, each providing a different speed of release. 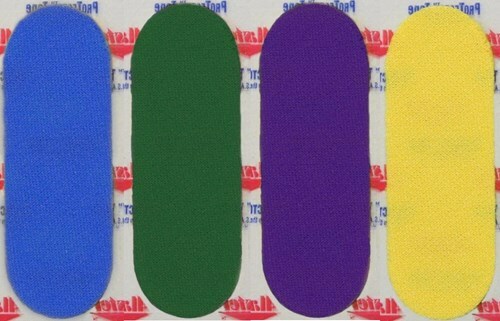 The fastest release is provided by the yellow color tape, green is the slowest, and blue and purple are in between. A mixed bag is also available so you can try them all and find the one that works best for you. Have an answer to this question? Because this is a pre-cut piece, you can use this either way. When the tape is not precut pieces in roll and is labeled as a protecting tape only, that would only go on your hand or thumb but the performance tapes that are pre-cut go either way based on your comfort. 0 of 0 customers found this answer helpful. Did you? Yes | No Did you find this answer helpful? Yes | No Thanks for your feedback! Due to the time it takes to produce the Master Momentum Tape Mixed Bag ball it will ship in immediately. We cannot ship this ball outside the United States.